You can either start building your site from scratch, or import our demo site and then modify it to fit your needs. We will now explain how to do that. Now installing demo version is easy as never before, you can install any demo with just one click. Before installing demo please consider following: If you want your demo to looked exactly like selected demo and to prevent conflicts with current content, we highly recommend importing demo data on a clean installation. We highly recommend to create backup of your site before database reset. Please note that database reset means cleaning all content that you have in your WordPress and restore to WordPress defaults. You can use WordPress Database Reset plugin or WP-Reset plugin to reset your WordPress site and start clean installation. Here is how one click demo works – It took XML file with content, JSON file for Redux options and WIE file for widgets and set all them together with one session. 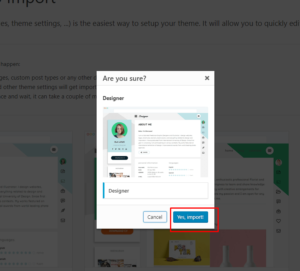 Once you installed the theme and activated required and recommended plugins, go to WP admin ▸ Appearance ▸ Import Demo Data and click on it. You will see below page where you will be able to choose any of predefined demos. 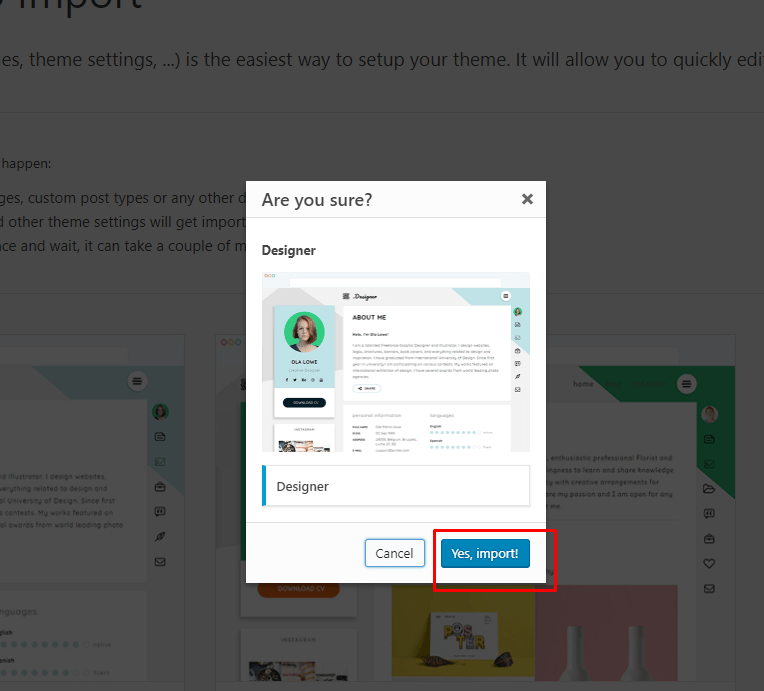 Select the Demo which you decided to import and then click on “Import” button. In opened popup approve your choice. Note: media files, posts and pages in demo content are different then in initial demo versions. We decreased posts and media files to make the demo load faster.